[JUNE 3, 2000] The regal Victorian doll which resides on Betty Bailey’s living room end table is dressed in a red-and-green plaid full-length dress, embellished with a bustle and tan ruffled trim. She is dressed in full 19th-century finery – from her green velvet hat to her formal shoes. A parasol rests in one hand. The 24-inch porcelain doll is just one of many lifelike examples of Bailey’s talent and profession evident throughout her home and business. Even though Bailey’s natural talent is evident, she didn’t attend art school and never planned on being a business owner. What started as a casual interest in antique doll collecting 20 years ago turned into a thriving business for the Lincoln woman, who owns and operates Lincoln Mold Co., Inc. Bailey, who sells dolls, doll molds, kits and clothes patterns, operates her business from her home at 127 Crestwood St.
“I enjoy it. It’s really held my interest. I’ve got so many ideas. I know some artists get tired and quit because they run out of ideas,” she said. But Bailey is inspired to create a new doll when she sees the face of a friend’s child or comes across an interesting picture in a magazine. Soulful eyes, a freckled nose or round face are a few of the features that may prompt her back to her work space in the garage to begin working on a new doll mold. She likes “freckles, big noses, interesting eyes and character,” she says, and the expressions and features of the faces of her doll creations prove it. And even though her collecting is what started it all, she now says she doesn’t consider herself a doll collector. She receives her pleasure not from accumulating hundreds of dolls to line the walls of her home but rather from making dolls and molds for other people to create their own versions to enjoy. 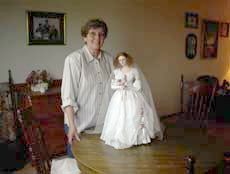 Even though a Victorian woman sits next to the sofa, a baby doll sits on an antique desk in the dining room, and one of her latest doll creations, featuring a satin wedding dress, sits casually on the floor – all proof of her passion – she has a very casual attitude about her talent and work. A Louisiana native, she has lived in Lincoln about 10 years. Although she attended college and majored in education, she quit school to become a homemaker after getting married and having two sons. 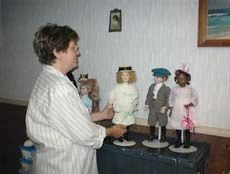 While living in upstate New York in 1980, she developed an interest in antique dolls. That was the beginning of an evolving love and connection with all aspects of doll-making. “When you collect, you read about them (dolls) and how they were made. Of course, back then, they were made by craftspeople but they were truly art. I wanted to re-create what they did. I just took off on my own,” she said. Armed with more determination than knowledge, she says she “just hacked my way through the underbrush,” to learn how to make doll molds. With no instruction book to be found, or formal training, Bailey set out to make her first doll mold and soon found it wasn’t easy. “Of course when you learn like that, everything that could go wrong, does go wrong. That’s how I got started. After I learned how to do it, then I started making limited edition dolls,” she said. She began selling her dolls at craft shows and slowly building her business, while also making and selling plaster molds, from which porcelain doll bodies are made. “There’s not anything written about how those early craftspeople made those dolls. Just a nugget here and a nugget there. But I know enough about it, I can pick up on those nuggets,” she said. A completed doll can sell for up to a few thousand dollars, while the mold sets usually cost between $200 and $266. She has designed and created several popular kinds of dolls, from her “Front Porch Children” collection – depicting small children with names like June Bug, Pi Biedy, Bubba and BJ Kendrick – to her “Fashion Plate” collection, depicting Victorian women dressed in their 19th century finery. Fashion plates, which were the “fashion photography” of that period, were works of art reproduced from engraved copper plates and hand-colored. The sculpted women dolls show the stylized features considered fashionable in the 19th century, including long necks; smooth, rounded shoulders; small, pinched waistlines; and graceful hands. The dolls are draped in full, pleated dresses and many are holding parasols. But Bailey said she has no favorites – she prefers whichever one she is working on at any given time. One of her sons helped her get the business up and running, but he has since married and moved to another state. Her late husband also helped her with aspects of the business, such as traveling out-of-state to doll shows. Now she runs the business on her own and has no plans to retire. Her garage workshop, once the site of all the mold making, still holds boxes of mold materials, although the molds are now made off-site. Her basement office is filled with shelves of doll clothes patterns and doll catalogs advertising her work. Although she says she now sells more clothing patterns than molds, her business continues to grow, and she has plans for a website, from which she hopes to reach new customers and markets.